Looking back at my diary earlier that year, I had written that 'my hands and feet are throbbing, my knuckles are purple, my hands are so painful and my fingers are swollen'. The symptoms were endless and what worried me most was that this was in the summer. Later on, in the depths of winter, I feared the journey to school as I found myself struggling to wait for the bus early on a January morning in the cold. After visiting the doctor and having tests, I was diagnosed with Raynaud's syndrome. As time went on I managed to keep my condition under control by keeping warm and I learnt quite a few tips along the way too! Personally, the worst part of Raynaud's was suffering the pain in my joints and the swelling, which accompanied the sudden rush of blood when going from a cold to hot temperature. Since then, I have been able to manage my Raynaud's and tried to carry on with my life. I started attending university, studying Business and Media. Throughout my first year, I really defied the odds for someone suffering with a condition like mine. I played football for the university team in all weathers and regularly attended football matches. Football matches are always a challenge for me as it gets so cold on the terraces and my anxiety creeps in, exacerbating an attack. Despite this, football is something that I am passionate about and something that I live for, so I am not prepared to let my cold hands and cold feet stop me. After a particularly cold month, which had me stuck indoors all of the time to avoid the frost, I booked a flight to Barcelona for a few days which really lifted my mood! 17oC had never made me so happy. It was a brilliant way to unwind before going back to university. After my break, I decided to take part in a charity event in aid of a homeless charity. This meant sleeping outside in a sleeping bag from 8pm to 7am. I knew this would be my biggest challenge yet but it was worth it and the moral support from friends really helped. I prepared as much as I could for freezing conditions outside, including a blanket, thermals, a flask and extra layers. By the end of it, my fingers were yellow and my body felt numb, but nothing compares to the feeling of making a difference and completing such a momentous event. Recently, I completed my first shift as a Wembley Connector, which involves up to ten hours outside of Wembley Stadium helping and directing customers. 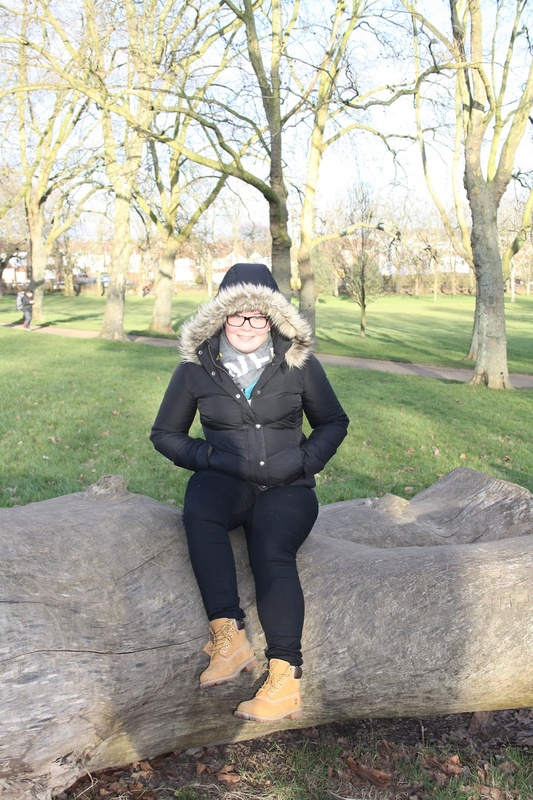 I wore two coats, thermals and a scarf as an attempt to keep as warm as possible! It was tough but it is a very enjoyable job and I am proud of my achievements despite such a debilitating illness, which is incredibly difficult to explain to people. Despite the challenges, I am confident that I can deal with my condition. 1. I purchased a duck down coat, which is honestly a lifesaver. The pockets are fleece lined which are perfect to keep your hands warm. 2. Hot Chocolate. Any opportunity I get I have a hot chocolate to hold and keep warm whilst watching football. 3. Hand warmers that I purchased from SRUK are much more effective than the ones you reheat. 4. When my hands are going numb and very cold I place my hands under my armpits as it really helps to warm them up really quick. 5. If possible, use a timer so that your heating system turns on before you get up in the morning. I find it so hard to get up when it is freezing in the house. Do you have a pain story that you would like to share? If so, email cloudypain@manchester.ac.uk and we will help you to pull your experiences together. Stories can be completely anonymous if preferred.